If you’ve come to the fabulous Upper East Side apartments, you’ve no doubt dedicated yourself to the New York City lifestyle. Part of that lifestyle, of course, is learning as much as possible about the fabled landmarks that make Manhattan so unique. A capital idea, if you ask us, and there’s a great place nearby to start educating yourself about the city’s history: world-famous Rockefeller Center. Located right in iconic Rockefeller Plaza, this 22-acre complex includes more than a dozen buildings, and stretches well back into New York City’s history. It’s growth is tied to NYC, and new, longtime, or even prospective resident of the island would do well to learn as much as they can about this well-regarded city landmark. 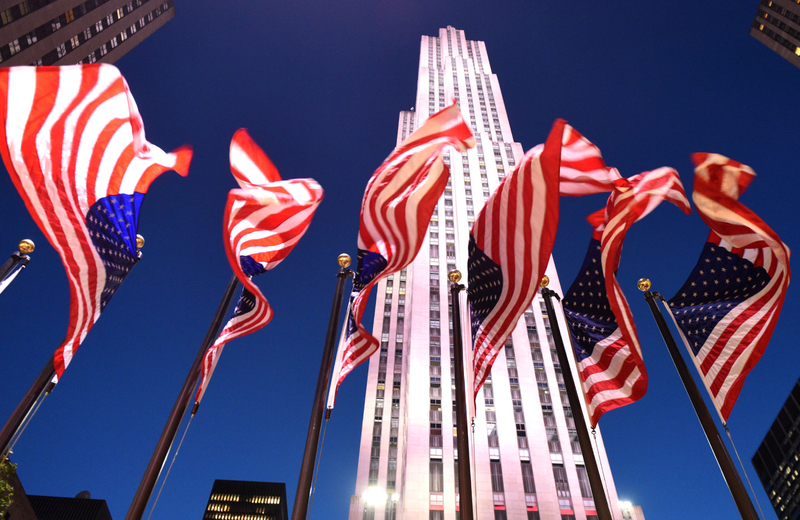 Read on, because today, we’re going to delve into that Rockefeller Center history, along with all the things you can expect when you pay a visit to Rockefeller Plaza in the present day. The construction of Rockefeller Center has oft been described as one of the greatest achievements of Depression-era America. The idea for this “city within a city” came to John D. Rockefeller Jr. more than 100 years ago, but it wasn’t until the 1930s until work on his grand vision began. After several years of planning in the late 1920s and early 1930s, construction on the original Rockefeller Center began in 1931. 228 buildings at the site of Rockefeller Center were razed; some 4,000 tenants were relocated. Those first few buildings — most notably, the RKO Building — went up during a period in the early 1930s. The RKO Building went up in 1932, as did the Music Hall. The British Empire Building went up in 1933, along with the RCA Building. Rockefeller Plaza was completed from 1933 to 1937, and the Prometheus statue was completed in 1934. Other buildings followed, and though the complex suffered a hit in profitability during World War II, after the war was through the complex was almost completely rented out, bringing in the revenue necessary to make it a profitable venture. Expansion continued after the war, with large corporations moving into offices on the compound. Among the many buildings on the site of Rockefeller Center, though, there is perhaps one more notable than all others, the famed “Radio City Music Hall.” Nicknamed the “Showplace of the Nation,” it was, for many years, the number one tourist destination in New York City. It’s home to the Rockettes, and the current location of many events like the Tony Awards, and a great many live stage shows. There are, of course, other fine works of art all around Rockefeller Center, but few can compare to the grandeur and symbolism provided by this pair of amazing statues. The “Top of the Rock” is a nickname for the roof of Rockefeller Center. From here you can enjoy “sweeping, unobstructed views of Central Park and Midtown,” taking in the backdrop of the city like few other rooftops can provide. It’s open from Sunday to Saturday, 8:00AM to 12:30Am, and you can purchase tickets for this experience directly from Rockefeller Center’s website. While you’re there, you can also plan for a tour of Rockefeller Center. The guides will take you all around the best parts of the compound, revealing bits of the Center’s history, and letting you see the city like never before. Remember that you don’t have to schedule a tour just to have a great time at Rockefeller Center in its current form. You could, for instance, head to some of the shops on your free time. This is one of Midtown Manhattan’s finest shopping centers, with more than 100 unique stores and plenty of cool things to pick from. Clothing, books, kids toys, jewelry — whatever you might be in the mood for, you can find it here. Alternatively, you could grab a bite to eat at one of the many fine dining establishments located around Rockefeller Center. From bakeries to casual fare and beyond, you’ll find plenty of sumptuous treats here at Rockefeller Center, and you’ll likely enjoy whatever it is you decide to eat. Last, but not least, a trip to the Channel Gardens may prove to be exciting. You can check out all of the amazing floral installations in all their glory, and even see some special exhibitions from time to time that take the art of plant arrangement to new heights. Did you know that Rockefeller Center is barely a mile walk from the stunning Renoir House Apartments? You can take a peek at this piece of New York City history, then return to the stunning residences and beautifully designed community spaces of this sleek and elegant rental complex in no time flat. It’s all part and parcel of the “quintessential new york city experience,” one that you’ll fall in love with quickly, and one that makes every facet of this great metropolis a part of your day-to-day. Check it out, take a look, then make Renoir House your choice for Manhattan done right.